Rosh HaShanah is closing in! It’s time to make menus with all my favorite symbolic foods! Pomegranate! Dates! Golden squashes! Honey! Apples! Leeks! Hurrah and hurrah! In the name of full disclosure I should tell you, I don’t really like sweet meat dishes. And I especially dislike sticky sweet glazes and sauces on meat. I don’t know why, but it’s just not my thing. I usually resort to a simple roasted chicken or maybe a braised meat with interesting flavors. Many High Holy Day meat recipes tend toward very sweet and very sticky – I suppose that’s what you get when one of the central symbols is honey. If I have a sweet element with a meat main course it is usually a relish, chutney, or roasted fruit rather than a sauce or glaze. 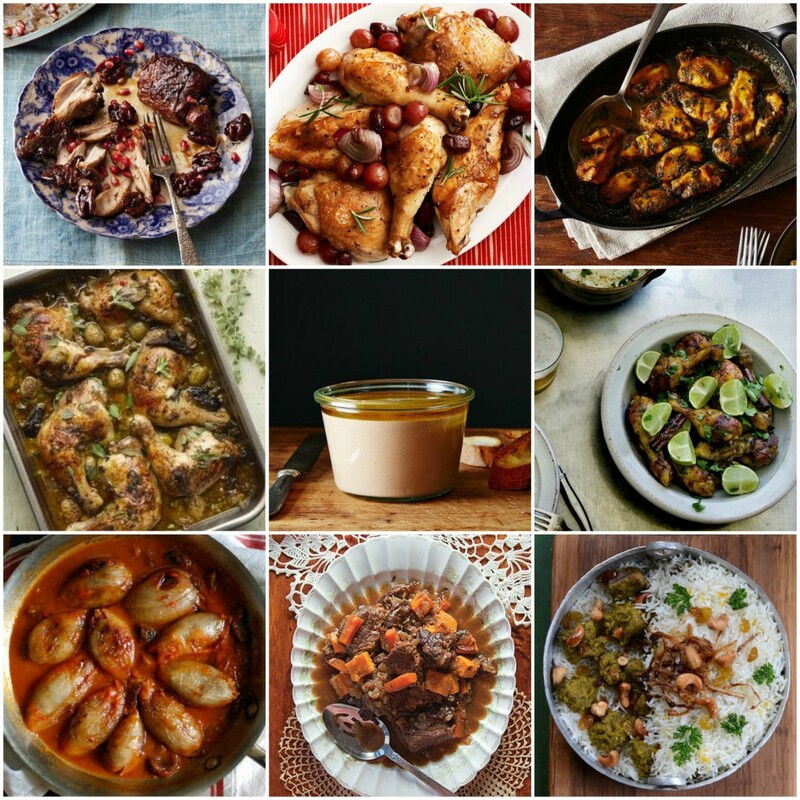 Below is a round-up of tempting and topically appropriate meaty menu ideas for the holiday. Balaboosta Chicken with Pomegranate and Walnuts – This recipe is simple, easy, and very hands-off – perfect for a big gathering. I would prepare some roasted veggies – maybe golden beets and carrots for their beautiful color, and several fresh salads. On a side note, if you love Israeli and Middle Eastern food with a refined twist, this cookbook is for you! Harvest Chicken with Olives, Grapes, and Rosemary – I love this author’s blog, Smitten Kitchen. This is the kind of sweet meat dish I enjoy – the sweetness comes from fruit and is tempered by salty, briny olives and my all-time favorite herb. Maple Curry Chicken with Kale – This comes perilously close to sticky/glazey, but I think the flavors are hearty enough to stand up to the sweetness. I would make this with Silan – date molasses, instead of maple syrup. After all, date molasses was the original, Biblical honey (“a land flowing with milk and honey”). When I lived in Israel I used Silan as a local replacement for maple syrup with great success. Ottolenghi Chicken with Dates, Olives, and Capers – Here I go again with fruit and olives! Ottolenghi is legendary for delicious and interesting versions of traditional Middle Eastern foods, and this looks like a wonderful recipe for a large group of people. I would serve it in my Le Creuset stoneware dish for maximum impact. Chicken Liver Mousse – Lighter, smoother, and fluffier than the traditional chopped liver, this is a refined addition to appetizers. I would replace the butter with coconut oil or more schmaltz and serve it with a sweet jelly or jam and plenty of challah. I use this recipe from David Lebovitz’s blog (originally from Michael Ruhlman’s excellently named The Book of Schmaltz: Love Song to a Forgotten Fat. Manger Pirate Chicken – For something very different, check out this exotically spiced chicken dish from an elegant blogger in the French countryside. The chicken is redolent with cinnamon, coriander, garlic, and lime and drizzled with honey. I would make some coconut rice with lime zest and some crunchy salads. I would even consider making challah with coconut oil and a dash of cinnamon to keep with the theme. Persian Stuffed Onions – Not Derby Pie is one of my first stops when I need gastronomic inspiration for Jewish holidays. The recipes are always good, and the writing charming but never precious. This recipe is gorgeous, and you could easily make a vegetarian batch too! Tzimmes (Beef and Root Vegetable Stew) – Sometimes you just need to keep with tradition. My mother makes Tzimmes for the holidays and it is one of those dishes that is so deeply ingrained in my memories – the smell of it cooking is heavenly. In an effort to bring some new-fangled and carb-conscious attitude to the table, I would serve this with jeweled cauliflower rice. Kosher Lamb Biryani – I love Indian food, but many of the recipes use yogurt to marinate and tenderize meat, making it a kosher no-go. This is a traditional Jewish Indian take on a lamb and rice dish that would be exceedingly welcome at my table. I would definitely serve it with some Apple and Date Chutney! So there you have it, friends! Lots of meaty ideas, so little time. In the coming week, I’ll have a round up of vegetarian main dishes and side dishes, as well as an epic list of decadent desserts! Stay tuned!